Setup in 2005, iSmile Dental Software was designed from the ground up by dental practitioners who have a unique understanding of the needs of a busy dental practice. iSmile Dental Software very quickly enhanced functionality traditionally offered in the marketplace by introducing modern and intuitive features. 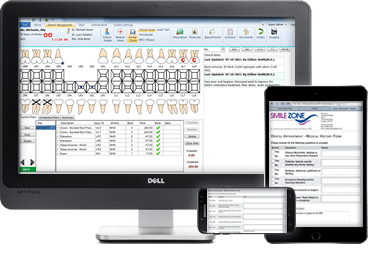 Patient management, treatment planning, diary bookings, finance tracking, recalls, reminders and day to day administration – iSmile Dental Software handles it all giving you the peace of mind to concentrate on the care of your patients. We’ve been using iSmile Dental Software for about ten years now. We’ve found it to be easy to use, completely reliable and we have direct access to our own Consultant. iSmile is like a trusty forceps, it just works! We don’t have any problems with iSmile and its a truly headache free experience dealing with their staff. We have been using iSmile at another practice for a number of years (where we previously used Software of Excellence) and could not wait to move away from R4 at Nightingale Cottage Dental Practice. iSmile is intuitive, easy to use and helps with all aspects of patient care. Thank you for an excellent support service! I contacted iSmile to install software at my new practice. Although I had not used iSmile before I had heard great reviews and I was impressed with both their sales process, training handover and of course their ongoing support. Its the best software out there and I would not recommend any other system. We found using iSmile and dealing with their staff a walk in the park! I chose iSmile over the competition as it looks fresh and there are a lot of great functions that make Software of Excellence and R4 look dated. The pricing is competitive and their aftersales support is brilliant. I wouldn’t choose any other software for my practice. I wasn’t even planning on getting any software for my practice but once I took a demo I was convinced that my business needed it. iSmile have a positive energy and the system is very user friendly. Training was excellent and the aftercare is amazing. No delay in response at all and they are always updating the features.